The day started with breakfast at Kono’s Restaurant, Haleiwa, HI. 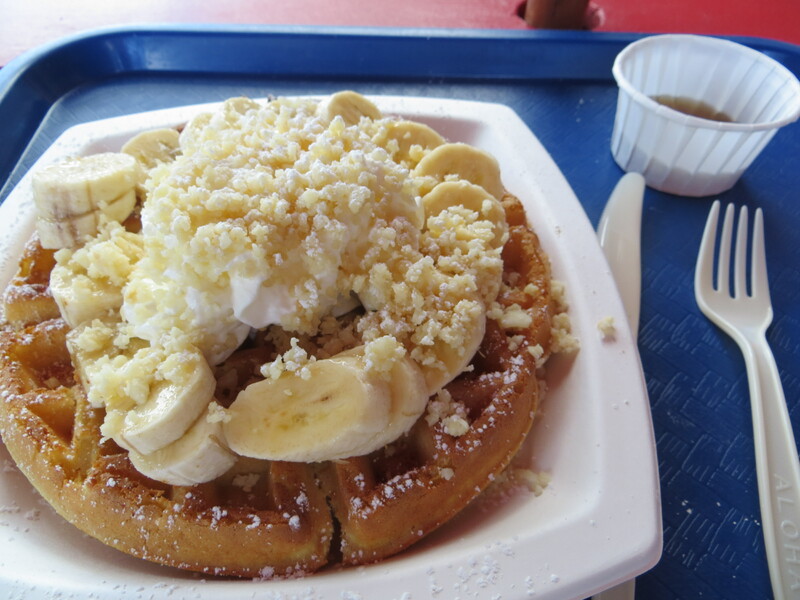 I had the best waffles ever, with bananas, macadamia nuts and whipped cream; Armando had what he say’s was the best breakfast wrap ever! No better way to start the day than with satisfied tummies. I have always wanted to go to the North Shore on Oahu, Hawaii. I finally checked that off my bucket list on March 4th, 2013. To sum up our day at the North Shore, it was beach hopping from one end, to the other. 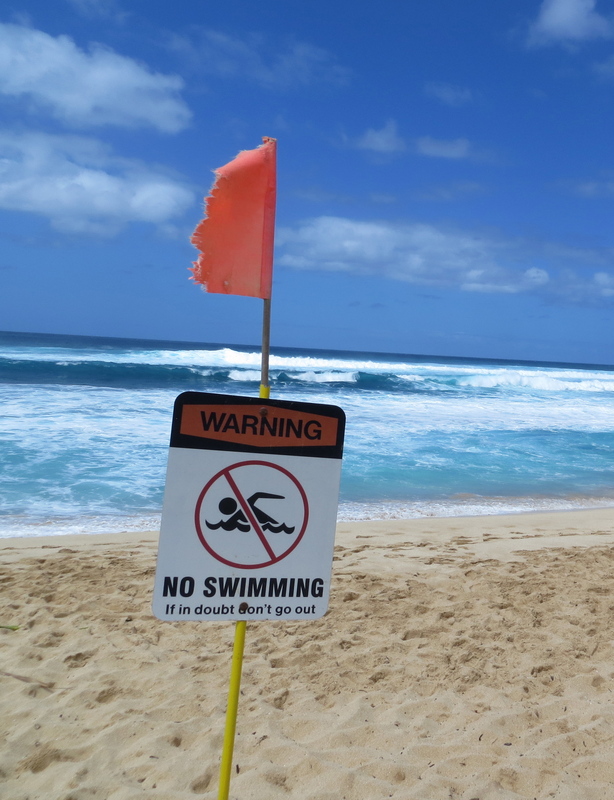 We followed the waves from Sunset Beach and the “Banzai Pipeline” to Waimea Bay and beyond. Because of the crazy waves, it was not a place to swim, although Armando wanted to. 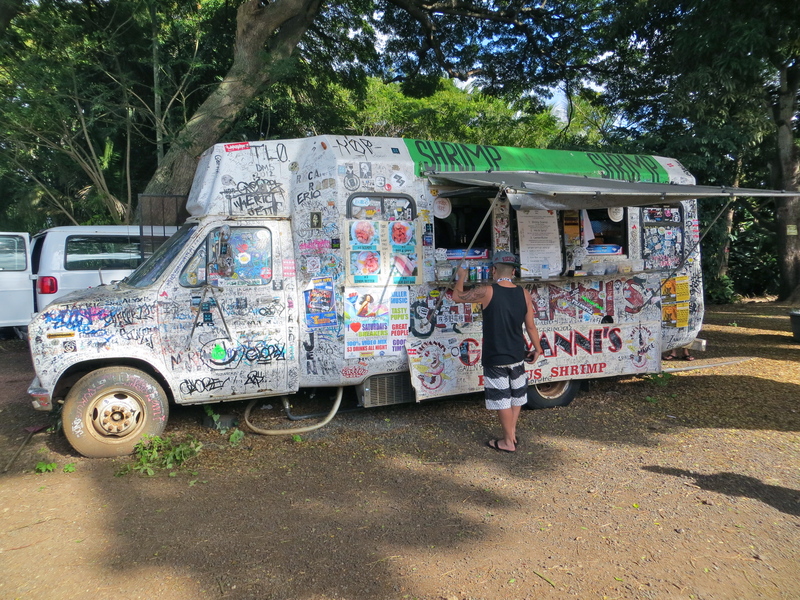 The North Shore is known for their shrimp trucks and we stopped for lunch at the original: Giovanni’s Shrimp Truck, Haleiwa, Hawaii. The power of those waves! Amazing! I could watch them all day. Actually, that’s what we did do. When we asked the lifeguard how big the waves were, he said that the large ones hitting the shore were probably up to 16 feet and the ones further back that the guys were surfing, probably 20 feet. Not as high as some videos I’ve seen but they were the most impressive ones that I’ve ever seen in person to-date. 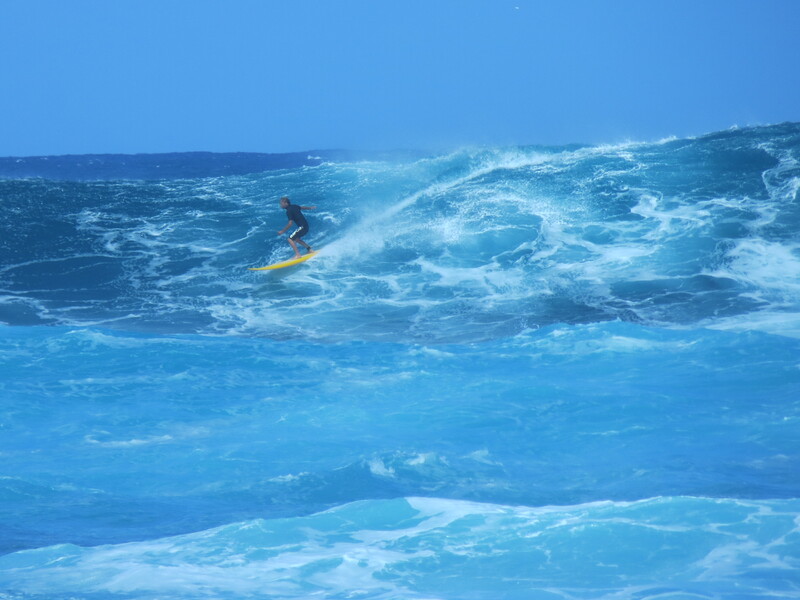 Here’s some video footage, from Waimea Bay. Take note of just how close to the shoreline those waves break and watch for little heads bobbing in the waves. 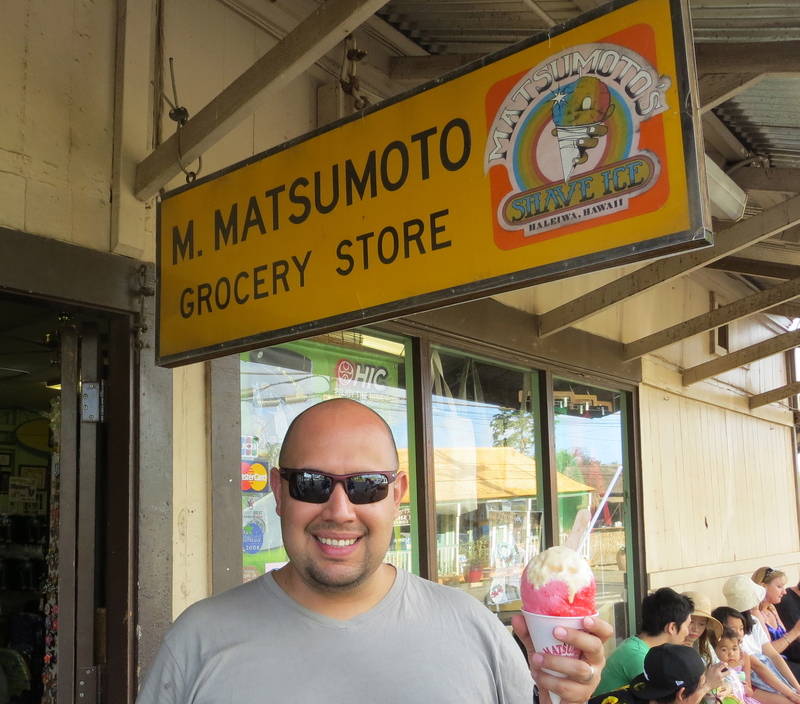 We did a must stop for some famous North Shore shaved ice at Matsumoto’s and it wasn’t a day on Oahu until we saw some whales. 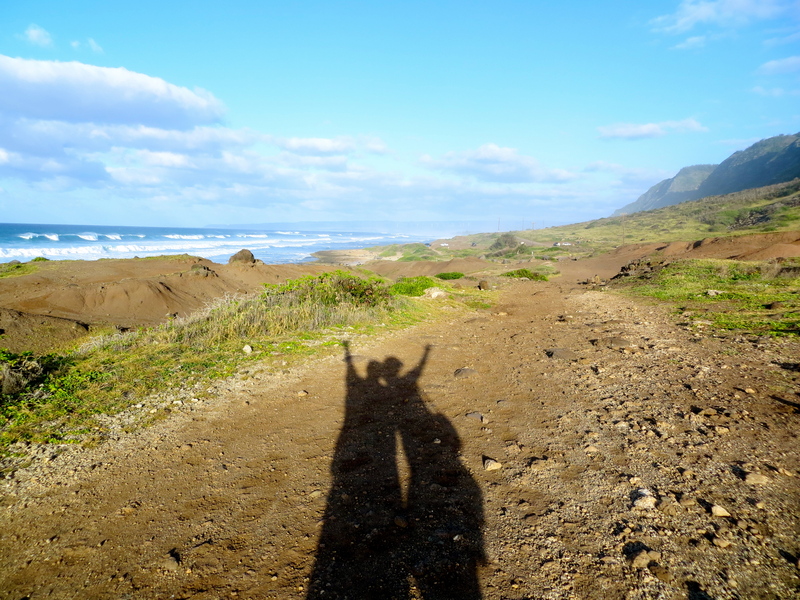 We ended our North Shore trip at the end of the North Shore road, near Kaena Point (see picture below). I think I was a surfer chick in another life. North Shore was great!